This week a team from Care4Calais travelled to Paris with a van full of various items requested by the formidable Danika. 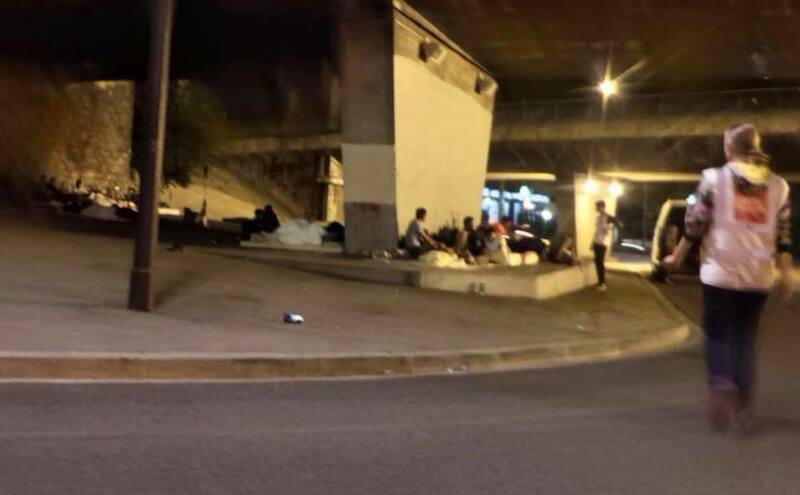 We found a few hundred people living on the streets, scattered across various locations. The police continue to ceaselessly move these refugees on to ensure a camp does not form. Some of them were newly arrived refugees looking to claim asylum in France, and others were the lost soles who have been rejected via the “Dublin” procedure and now wander Europe with no hope for the future. There are now five centres that are taking in new arrivals for asylum processing, as long as they are ‘fresh’ without Dublin, three for single men and two for families. This still leaves families and single man in similar proportions on the streets as most of the options for family social housing are full and closed to new arrivals. There also continue to be unaccompanied minors living in the streets, with resources to deal with them severely stretched. Most of the refugees were still in their summer clothes and, even though it is quite warm now, that will not last much longer. They need full change of clothes and the associations on the ground do not have what they need to get through the coming winter. Without a solution from the government the volunteers will continue to do all they can where they can. To enable us to maintain supporting Paris please donate, volunteer, spread the word through social media and your friends.